POKHARA, Sept 19: Downtown Pokhara is getting a dangerous place that can claim life! And the threat is flash floods on its street. These floods claimed four lives in the past three weeks, earning a terrifying image for the town, which otherwise is a favorite among national and international tourists. The floods triggered by incessant rainfall had swept away three pedestrians and a motorcyclist. According to police, 58-year-old Krishna Bahadur Thapa of Lamachaur and 40-year-old Gangaprasad Subedi of Syangja were swept on Sunday. On August 31, Meeta Bhandari, 41, was swept away by the flood near Siddhartha Chowk and thrown into a nearby sewer, where she breathed her last. A week later, 21-year-old Surbir GC was swept away by the flood near Firki River. “It seems the roads have turned into rivers. Water flows on them at even greater force than the flooded rivers. It’s very scary,” said Mohan Mani Adhikari, police inspector at the Baidam Police Station. “Though the flood in the river enters onto the road with lesser force, when the flood makes it way through the inclined roads of the market, it gains force enough to sweep people away with it. It’s not a usual case and therefore four were swept away by it. The decease might not have anticipated such force from overflowing floods in the town,” he opined. Locals shared that in the recent years rain pattern in Pokhara has changed. Though it has been always known as a city that receives frequent rainfall, recently it has been received heavier rainfall. Last Saturday’s rain was so incessant and so heavy that the locals had, in fact, anticipated some natural disaster hitting the town. Many said that they feared to come out in the open until the rain stopped. According to the weather forecast department, 274.2 millimeter of rain was recorded from Saturday evening till Sunday morning. Those who lost lives on Sunday were among those who were walking on the road at night. Locals complained that if the roads had a proper sewerage system for directing the flood off the road, four lives could have been saved. Sewerage pipelines were laid down in the area decades back but since then remain unattended. Rapid urbanization in the town has been alluded one of the major reasons for over flooded rivers and streams in the area. “Earlier there was open land all around and therefore much of the rainfall used to be absorbed by soil. But now, there are houses all around. And even those houses release waters in the road,” said Sharad Mohan Kafle, Engineer at the Sub -Metropolitan city of Pokhara. “It is basically due to the concrete jungle. Haphazardly erected buildings and the mismanagement of drainage system have taken toll on the safety record and beauty of this town,” he added. He added that there is no way out for water to flow through the roads as there is no space left in the area. Since there are rivers around the market they swell during incessant rain. And the waters easily enter the market. According to Kafle, overflow of water easily reaches to Birauta from Nadipur. The market areas receive water both from the flooding rivers and from the sky. “All the water from the sky gets accumulated in. Then added is the water from the rivers. Hence, the roads are full of water. And since the roads are narrow, it flows out with force,” explained the engineer. He added that it is no surprise if people are swept away, especially when they are walking on the streets at night. “People have to be very careful. Monsoon has not ended yet. Incessant rain poses high risk,” he said. Kafle further stated that people get confused with gutter and road when it is inundated with water. In such situations, many might fall in gutter. “The road literally looks like water during heavy rain. It is not easy to figure out gutter and roadside. There are open gutters in the roads,” he said. There is around 250 kilometers of road in Pokhara. Of these 150 kilometers have open gutters on its side. The rest of the roads don’t event have them. Kafle said that the sewerage system of the city should be repaired for ensuring safety of its residents and added that sewerage system should be extended to other parts of the town that lack it. “Proper drainage system demands huge investment. In fact, this should have been thought while expanding the city. If things are not addressed even now, results would be worse,” he warned. 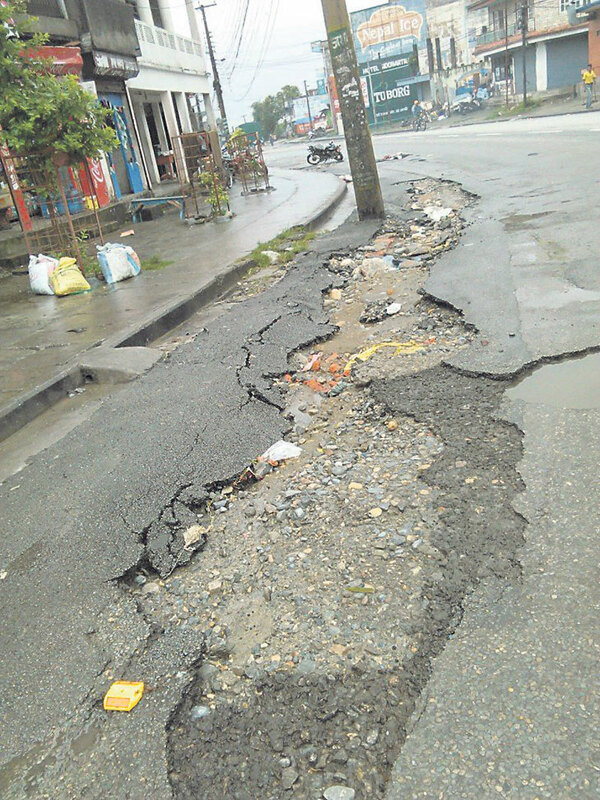 Roads in Pokhara are mostly narrow and on top of that potholes and lack of regular maintenance has left the road in rubbles in many parts. The monsoon floods make them life-threatening.